Before having Little Man when I went out for a meal with G or with friends it was a very relaxed affair; I would spend an hour or two choosing an outfit for a start. I would even manage a pair of heels. My face would be made up and we would sink 3 courses of food, a couple of glasses of wine and talk! Blissful. This was a rather long time ago! Then I had a baby. Sorry, I shall re-word that. Then I had a toddler. One that could move around a restaurant, shout very loudly and generally not be the most well behaved dinner guest. Now going for a meal out goes something like this. Fill up my biggest handbag with nappies, wipes, tablet (or Tumble Tap as it now called), books, crayons, beaker and back up food. To avoid busy restaurants we book a table for 5pm dinner. No time to change, put my make up or heels before heading out the door. We sit down to eat after explaining to Little Man how he must be a good boy and wait for his food. I throw a load of distraction toys at Little Man whilst we quickly pick our food. We ask for the bill while Little Man is still eating so as soon as he finishes we can leave before he gets bored, kicks off and there are crayons, books, bits of pasta and my sanity scattered across the restaurant floor. Does anyone have any methods they swear by when out eating with a toddler? Ha ha, exactly the same over here. My eldest has just started to get better/ easier at eating out in the last couple of months. She’s 2.5. It can still be a challenge though. We start with sticker books and one of those water paint books, then bring out the bug guns (ipad) when we really need it! Mummy Muddler recently posted…Toddler Vs Newborn: Which is harder? Sticker books or just stickers! S absolutely loves them and they can keep him busy for quite a while. He also loves watching videos of himself on my phone so that’s always my plan B! Yep this is us, oh how the times change! I also make sure our tablet is fully charged and we sit near a window where possible (not to throw toddler out of obvs) for distraction purposes! 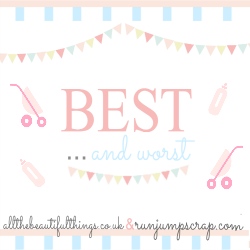 Thanks for linking up to the #bestandworst and hope to see you again next week!